OMAHA — Steve Goeser, president and CEO of Methodist Health System, has announced Josie Abboud as the new president and CEO of Methodist Hospital and Methodist Women’s Hospital. She will assume her new role on Oct. 1. Abboud’s career at Methodist began in 1996, as a critical care staff nurse at Methodist Hospital. She has held roles as a core coordinator for critical care and service leader of the hospital’s cardiovascular, pulmonary and intermediate care units. 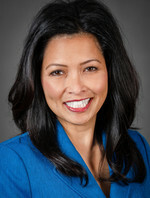 In 2008, she was named vice president of ancillary and professional services and was then appointed executive vice president and chief operating officer of Methodist Hospital and Methodist Women’s Hospital in 2016. “I am truly humbled and honored by the opportunity to lead Methodist Hospital and Methodist Women’s Hospital,” Abboud said. “My professional growth and development, which started here more than 20 years ago, is a testament to Methodist’s investment in its people and encourages all to aspire to leadership positions." In her new role as president and CEO, Abboud will oversee the operations of Methodist Hospital and Methodist Women’s Hospital, as well as the strategic vision and direction of both facilities. In addition, she will lead and navigate the organization through the changing health care environment balancing quality of care and value in order to achieve an exceptional patient experience. In 2017, Abboud was the ACHE Senior-Level Healthcare Executive Award recipient and the American Cancer Society National St. George Award winner. In 2009, she was named one of the Midlands Business Journal’s “Women of Distinction” and in 2006 she was an MBJ “40 Under 40” honoree. She is an active community leader and currently serves on the boards of the American Cancer Society, Hospice House, Creighton Prep Board of Trustees, Creighton University’s College of Nursing Advisory Board, Christ the King’s Steering Board and the Archbishop’s Committee for Development. She has previously served on the boards of the Visiting Nurses Association, Juvenile Diabetes Research Foundation (JDRF), Leukemia & Lymphoma Society, 6-state High Plains Division board of the American Cancer Society, United Way’s 2013 Campaign, Community Health Charities and Child Savings Institute. Abboud is a Fellow in the American College of Healthcare Executives and a member of the Medical Group Management Association. In 2019, Abboud will begin serving as District One Chairman of the Nebraska Hospital Association and will also be appointed to their Board of Directors. She and her husband, Jason, have two children, Xavier and Brielle.